REPORTERS & BLOGGERS: Sudden Cardiac Arrest (SCA) is a life-threatening emergency that occurs when the heart unexpectedly stops beating. It strikes seemingly healthy people of all ages, even children and teens. When SCA happens, the person collapses, becomes unresponsive, and is not breathing normally. The person may appear to gasping, snoring or having a seizure. SCA leads to death within minutes if the person does not receive immediate help. Survival depends on the quick actions of people nearby to call 911, start CPR (cardiopulmonary resuscitation), and if available, use an AED (automated external defibrillator) as soon as possible. Each year, 356,000 people experience EMS-assessed out-of-hospital non-traumatic sudden cardiac arrest and only one in 10 victims survives. Survival rates could double or triple if the victims receives immediate CPR. Learn more here. We have your expert sources. Call 724-934-0034 or email media [at] sca-aware [dot] org for immediate interviews. 12/19/17: Parent Heart Watch Wins National Video Contest Aimed at Raising Awareness About Sudden Cardiac Arrest, the Third Leading Cause of Death in the U.S.
6/2/15: Seven Things Everyone Should Know About Sudden Cardiac Arrest, A Leading Cause of Death in the U.S.
2/28/14: Sudden Cardiac Arrest Launches "You Can Save a Life at School AED Challenge"
06/06/13: Will Proposed FDA Action Reduce Access to Defibrillators for Victimes of Sudden Cardiac Arrest? 07/02/2012: Honor Your Heroes. Nominate Them for the Sudden Cardiac Arrest Foundation's People Saving People Award. The Sudden Cardiac Arrest Foundation joins countless Americans in grieving the loss of pop icon Michael Jackson. His apparent death from sudden cardiac arrest (SCA) is a painful reminder that SCA is a leading cause of death worldwide. Sudden cardiac arrest is the sudden, unexpected loss of heart function, breathing and consciousness. SCA usually results from an abnormal heart rhythm, often as a result of underlying heart conditions. Unfortunately, for many people, the first symptom of these conditions is SCA, meaning about two-thirds of unexpected cardiac deaths will occur without prior indication of heart disease. Approximately 250,000 people die every year from SCA in the U.S. alone. In fact, more people die each year from SCA than from colorectal cancer, breast cancer, prostate cancer, auto accidents, AIDS, firearms, and house fires combined. For more information about sudden cardiac arrest, including how it differs from the more commonly understood heart attack, as well as the critical links in the Chain of Survival, visit www.sca-aware.org. The SCA Foundation is a national non-profit 501(c)3 organization based in Pittsburgh, Pennsylvania. Its mission is to serve as an information clearinghouse and social marketing force focused on raising awareness about SCA, and stimulating attitudinal and behavioral changes that will help save more lives. Initiatives include an online registry for SCA survivors, an online community for people affected by SCA, an awareness campaign for schools, and the "People Saving People" awards. The SCA Foundation maintains a national database of survivors and experts available to speak with the media. For more information, visit http://www.sca-aware.org. Pittsburgh, Penn. – June 4, 2009 – The SCA Foundation today announced the winners of its first video contest designed to raise awareness of sudden cardiac arrest. The student competition drove teams from across the country to submit videos about the importance of CPR and automated external defibrillator (AED) use, and empowering students to make a difference in helping to save lives. The Grand Prize Winner is St. Francis de Sales Catholic School in Salisbury, Maryland. The SCA Foundation will award the school with a new AED, three CPR Anytime™ kits, and a Nintendo Wii game system. Teams of students wrote, filmed, starred in and edited their own 3–5 minute videos promoting the importance of CPR and AED use. The SCA Foundation panel of judges reviewed the entries for their overall message, creativity, originality, degree of student participation and likelihood to raise awareness. Finalists were posted on the SCA Foundation’s website (www.sca-aware.org/schools) and on its YouTube Channel (http://www.youtube.com/user/SCAFoundation) and promoted to schools nationwide. While technical accuracy was not a key focus in the judging, one of the objectives of the contest and its prizes is to encourage the development—through awareness and training—of potentially life-saving skills. Second Place: Franklin County Technical School, Turners Falls, Mass. The First Place winners will receive an AED and a CPR Anytime kit. Second Place winners will receive a $200 gift card and a CPR Anytime kit. Third Place winners will receive a $100 gift card and a CPR Anytime kit. The awarded AEDs were donated by Cardiac Science and ZOLL Medical Corporation, both sponsors of the Foundation’s You Can Save a Life at School™ awareness campaign. The Sudden Cardiac Arrest (SCA) Foundation is a national non-profit 501(c)3 organization based in Pittsburgh, Pennsylvania. Its mission is to serve as an information clearinghouse and social marketing force focused on raising awareness about sudden cardiac arrest (SCA), and stimulating attitudinal and behavioral changes that will help save more lives. Initiatives include an online registry for SCA survivors, an online community for people affected by SCA, an awareness campaign for schools, and the "People Saving People" awards. The SCA Foundation maintains a national database of survivors and experts available to speak with the media. For more information, visit http://www.sca-aware.org. Roman Matlaga Receives First Ever "'People Saving People(TM) Award"
PITTSBURGH, June 17 /PRNewswire-USNewswire/ -- The Sudden Cardiac Arrest Foundation presented its inaugural People Saving People(TM) (PSP) Award on Father's Day in Las Vegas. The annual award program honors 'ordinary' people with extraordinary heroic spirits, who help save the lives of victims of sudden cardiac arrest (SCA). The Foundation proudly recognized Roman Matlaga, of Honesdale, PA, whose actions made the difference between life and death for fellow basketball player David Belkin, of Bethesda, MD, in February 2007. The PSP award was presented Sunday during the Citizen CPR Foundation's biennial conference, Emergency Cardiac Care Update, in Las Vegas. "It is an honor to present the first-ever People Saving People(TM) award to Roman Matlaga," said Mary Newman, SCA Foundation president. "Bystander action is critically important in cases of sudden cardiac death because time is of the essence. A matter of seconds separates those who live from those who will die. We hope this award will bring attention to the fact that anyone -- and everyone -- must be prepared to help save a life." Located 30 miles northwest of Scranton, Lakeside Elementary is within the Wayne Highlands School District of Honesdale, PA, where officials have outfitted all district schools with automated external defibrillators (AEDs). Belkin, 65, collapsed during a basketball game in the Lakeside school gym on a Sunday morning in mid-February, 2007. Matlaga and his teammates sprang to action immediately, starting CPR and making quick use of the school's AED. After a combination of chest compressions, rescue breathing and one AED shock, Belkin awoke and asked, "Did we win?" Although Matlaga is an emergency physician, he stresses that it doesn't take a doctor to save a life. "Any one of my teammates could have taken charge of the situation," he says. "Everyone needs to be prepared to take initiative -- you never know when something like this will happen." Others recognized for their lifesaving actions were Eleanor Liebowitz, of Huntington Station, NY, who saved her husband Jerome, by calling 911 and following cardiopulmonary resuscitation (CPR) instructions from dispatchers, and Susie Gibbs, of Humeston, IA, who saved her husband, Butch, by giving CPR and using an AED. The Sudden Cardiac Arrest (SCA) Foundation is a national nonprofit 501(c)3 organization based in Pittsburgh, Pennsylvania. Its mission is to serve as an information clearinghouse and social marketing force focused on raising awareness about sudden cardiac arrest (SCA), and stimulating attitudinal and behavioral changes that will help save more lives. Initiatives include an online registry for SCA survivors, an online community for people affected by SCA, an awareness campaign for schools, and the "People Saving People" awards. The SCA Foundation maintains a national database of survivors and experts available to speak with the media. May 15, 2008 – PITTSBURGH – One year ago, the Sudden Cardiac Arrest Foundation launched the SCA Survivor RegistryTM, the nation’s first online registry for people who suffered sudden cardiac arrest (SCA)—and lived to tell about it. Information submitted by 171 registrants offers a glimpse into the small community of rare individuals who beat the odds and survived this national killer. One-third are 40 years old or younger. Most had no prior history of a heart condition. Most received cardiopulmonary resuscitation (CPR) and were treated with a defibrillator. Few were treated with mild therapeutic hypothermia (state-of-the-art treatment recommended for survivors to preserve brain function). Most now have implantable cardioverter defibrillators (ICDs). Most say they have returned to their previous level of functioning or to their previous level of functioning, with some limitations. The registry also enables survivors to share their insights in narrative form, providing important qualitative information. A common theme is a deeper appreciation for the opportunity for a second chance at life. Clearly there are limits to interpretation of quantitative data. Registration is voluntary, the sample is self-selected, participants are comfortable with Internet use, and information is either self-reported or, on occasion, reported by a family member. In addition, some survivors are not sure what treatments they received and did not complete all data fields. As the registry begins to grow, however, trend analysis could yield important information about key characteristics of survivors and interventions that save lives. Keith Lurie, MD, an electrophysiologist from Minneapolis, Minn., who serves as an adviser to the SCA Foundation, has high praise for the registry.“The Registry is terrific: As we change the way CPR is performed and add new techniques and technologies to improve survival rates, the registry provides a critical means to follow our progress and celebrate our saves. By keeping track of the survivors and telling their stories, more and more people will realize there has been tremendous progress in the treatment of the nation’s #1 killer,” he said. Do you care for people who are sudden cardiac arrest survivors? Encourage them to visit www.sca-aware.org, join the SCA Survivor Registry™, and share their experiences and insights. Do you know anyone who has survived SCA and would like to help others survive? Encourage him/her to visit www.sca-aware.org, join the SCA Survivor Registry™, and share his/her experiences and insights. Sudden cardiac arrest (SCA) typically results from an abnormal heart rhythm. When SCA occurs, the heart stops beating altogether. As a result, blood no longer is pumped throughout the body, including the brain. The SCA victim is never awake and needs immediate CPR and treatment with a defibrillator. If nothing is done, the victim will die within minutes. About 250,000 people suffer SCA each year in the U.S. On average, 6-7 percent (~15,000 to 17,500) survive. The SCA Survivor Registry™ is an initiative of the SCA Foundation (www.sca-aware.org). The registry gives SCA survivors and their families the opportunity to find others who have been through similar life-changing events, share their experiences and insights, and help one another in the healing process. It also fosters research and awareness initiatives designed to improve survival rates. By collecting information such as the location of arrest, types of interventions and outcomes, the registry will help identify variables and trends related to SCA survival. Survivors who join the registry can opt to participate in survey research and efforts to increase public awareness, such as media interviews and community outreach. The Sudden Cardiac Arrest Foundation is a national nonprofit 501(c)3 organization based in Pittsburgh. Its mission is to serve as an information clearinghouse and social marketing force focused on raising awareness about sudden cardiac arrest (SCA) and stimulating attitudinal and behavioral changes that will help save more lives. PITTSBURGH – The Sudden Cardiac Arrest Foundation, a national nonprofit information clearinghouse, has launched the nation’s first online registry for sudden cardiac arrest (SCA) survivors. The SCA Survivor Registry™ will help connect survivors and family members with their peers. “The Registry will give sudden cardiac arrest survivors and their families an opportunity to find others who have been through similar life-changing events, share their experiences, and help one another in the healing process,” said Michael R. Sayre, MD, of The Ohio State University Medical Center, who serves on the SCA Foundation Board of Directors. The Registry will also foster research and awareness initiatives designed to help improve survival rates. Currently, only one in 15 SCA victims becomes a survivor. By collecting information such as the location of arrest, types of interventions and outcomes, the SCA Foundation hopes to identify variables and trends related to SCA survival. Survivors who join the Registry can opt to participate in survey research and efforts to increase public awareness, such as media interviews and community outreach. Survivors who wish to participate in the SCA Survivor Registry™, should visit www.sca-aware.org. Participation in the Registry is free. Sudden cardiac arrest (SCA) is a life-threatening condition that occurs when the heart suddenly stops beating effectively, often due to a disturbance in the heart’s electrical system. SCA is a leading cause of death among adults over the age of 40 in the United States. 250,000 people die every year from SCA, according to the Centers for Disease Control and Prevention. Approximately 10 percent of SCA events occur among people less than 40 years of age. To survive, a victim must receive effective cardiopulmonary resuscitation (CPR) and treatment with a defibrillator within minutes of collapse. PITTSBURGH – The Sudden Cardiac Arrest Foundation, a national nonprofit information clearinghouse dedicated to reducing death and disability from sudden cardiac arrest (SCA), has announced formation of the SCA Survivor Registry™. By collecting information such as the location of arrest, types of intervention and outcomes, the SCA Foundation hopes to identify variables and trends related to SCA survival and return to pre-arrest levels of functioning. In addition, survivors who opt to join the registry can indicate their interest in participating in survey research and efforts to increase public awareness, such as media interviews and community outreach. “The purpose of the registry is to identify people who have survived sudden cardiac arrest and who would like to help others survive,” said Mary Newman, executive director of the SCA Foundation. SCA is a life-threatening condition that occurs when the heart suddenly stops beating effectively, often due to a disturbance in the heart’s electrical system. On average, about 1 out of 15 people who suffer SCA survive. To survive, a victim must receive effective cardiopulmonary resuscitation (CPR) and treatment with a defibrillator within minutes of collapse. Research shows that survival depends more upon how quickly care is rendered, than whether the caregiver was a lay bystander or a healthcare professional. Edward M. Racht, MD, medical director for the City of Austin/Travis County (Texas) Emergency Medical System and leader of Take Heart Austin, encouraged Austin area survivors to join the SCA Survivor Registry™ at a survivor reunion held on Valentine’s Day in Austin. “The more we can work together on this important public health issue, the greater the chance that more lives will be saved,” said Racht, who serves on the SCA Foundation Board of Directors. SCA survivors interested in participating in the SCA Survivor Registry™ are invited to contact the SCA Foundation at info [at] sca-aware [dot] org or call 877-722-3475 (toll free) or 724-625-0025. Participation in the registry is free. Sudden Cardiac Arrest (SCA) is a leading cause of death among adults over the age of 40 in the United States and other countries. In the United States alone, approximately 250,000 people die every year from SCA, according to the Centers for Disease Control and Prevention. In fact, more people die each year from SCA than the number who die from colorectal cancer, breast cancer, prostate cancer, auto accidents, AIDS, firearms, and house fires combined. SCA also affects many young people. Approximately 10 percent of SCA events occur among people less than 40 years of age. On average, only one out of 15 of SCA victims survives. Take Heart Austin is part of a new program, Take Heart America (www.takeheartamerica.org), which aims to increase survival from sudden cardiac arrest in three locations—Austin; Columbus, Ohio; and St. Cloud, Minn. Take Heart America brings together a wide variety of approaches that have been shown to help increase survival—from training people in CPR and use of automated external defibrillators (AEDs) to working with doctors, paramedics and hospital personnel on advanced resuscitation techniques and post-resuscitation care, including cooling to prevent brain damage. (Pittsburgh, Penn. )–June 23, 2006– Some of the nation's most respected experts on Sudden Cardiac Arrest (SCA) – the leading cause of death in the U.S.– have joined together to launch the Sudden Cardiac Arrest Foundation. The new non-profit organization will advance best practices in resuscitation to save thousands of lives each year. SCA, often mistakenly perceived as a massive heart attack, strikes without warning and kills at least 250,000 Americans outside of hospitals each year - more than the number of people who die annually from colorectal cancer, breast cancer, prostate cancer, AIDS, car accidents, house fires, and gun shots combined. Ten percent of SCA victims are under age 40. Nationwide the SCA survival rate is only 6-7 percent and has remained stubbornly low for decades. 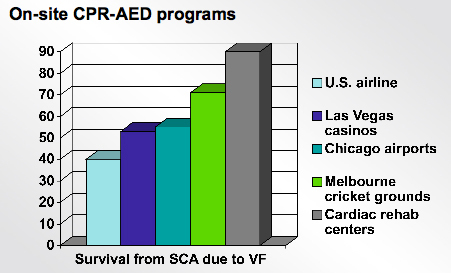 However, in pockets of the U.S. where concerted efforts have been made to train community and lay responders in CPR and the use of defibrillators; where defibrillators are ubiquitous in public places; and where new technologies have been successfully deployed, survival rates have reached as high as 43 percent in municipalities and 90 percent in some cardiac rehabilitation centers. “Sudden Cardiac Arrest is a treatable condition. It need not be fatal. By determining and disseminating information on successful strategies we hope to double the national survival rate within the next 10 years. Today, the new SCA Foundation embarks on a comprehensive educational outreach program directed at health and safety professionals, the at-risk community, and the general public,” said SCA Foundation President Mary Newman. 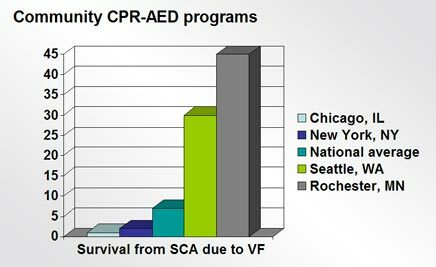 Most SCA victims lived in highly-congested cities or extremely isolated rural areas where emergency medical personnel skilled in CPR and equipped with lifesaving technology often cannot get to victims in time to save them. Emergency response time varies greatly around the country with the most at risk population generally located in large cities like New York, Chicago and Los Angeles. SCA occurs when the heart suddenly stops beating due to underlying cardiac disease, trauma, or other cause, and is unable to pump oxygen-rich blood to the brain. When SCA strikes, appropriate medical care must be administered within minutes. Survivability decreases by approximately 7 to 10 percent with each passing minute, according to the American Heart Association. It drops to zero after 10 minutes. In addition to increasing the SCA survival rate through education and awareness, the SCA Foundation plans to serve as a clearinghouse for SCA information, a resource for individuals and organizations interested in SCA, and a support center for SCA survivors and their families. The Foundation specifically hopes to increase the rate of bystander CPR from 20 to 30 percent within 5 years, double the use of AEDs outside the hospital from 5 to 10 percent within 5 years, and double the rate of survival from 7 to 14 percent within 10 years. Roger D. White, MD, FACC, Professor of Anesthesiology, Mayo Medical School, Rochester, MN. Individuals personally affected by SCA are invited to share their stories on the Discussion Forum at www.sca-aware.org. The site will also offer online peer-to-peer mentoring for emergency response planners. The Sudden Cardiac Arrest Foundation is an independent non-profit center of excellence focused on reducing death and disability from sudden cardiac arrest (SCA).